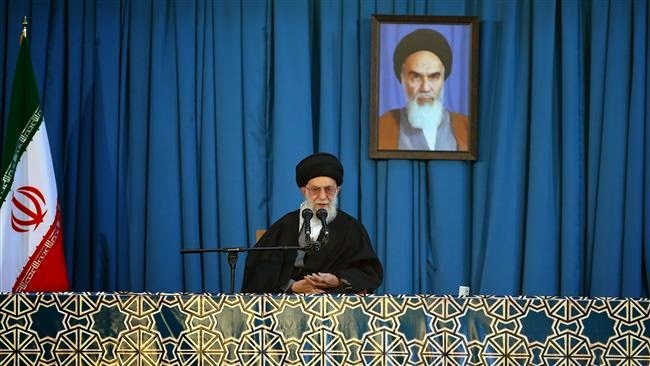 Iran’s Supreme Leader Ayatollah Ali Khamenei today delivered his New Year address to the nation from the holy city of Mashhad. State-run Press TV has published excerpts of the speech on its website. Here are excerpts relevant to nuclear negotiations and relations with the U.S.
- America says ‘we sign the agreement and monitor Iran’s behavior and then remove the sanction.’ This is erroneous and unacceptable and Iran will never accept this. This is America’s ploy. Removal of sanctions should be part of any agreement. - America expects Iran to take irreversible decisions pursuant to a possible nuclear deal which is not acceptable to the Islamic Republic. If the opposite side would be able to reestablish sanctions on any grounds, there is no reason for our negotiators to accept an irreversible condition. - What the Iranian nation is resisting against is bullying approach of the United States. The Americans say to Iranian negotiators ‘you come here and listen to what we say and implement them word for word.’ But Iranian nation will resist against this approach and will never accept it. Neither the negotiating team, nor the Iranian nation that support the team, will ever give in to such bullying. - The United States is in dire need of a nuclear agreement. There are political factions in the U.S. that do not want an administration run by their Democratic rivals to pull off nuclear agreement with Iran. - Negotiations with the United States are just about the nuclear case and do not cover regional issues or issues related to Iran’s domestic policies, including defense matters. - Iran and the U.S. have opposite views on regional issues. We want security and calm in the region, but the arrogant powers led by America pursue the policy of sowing insecurity in the region, which is quite opposite of our goals. - Obama’s Nouruz message included dishonest assertions and his claim of friendship for Iranian people was not sincere. Obama’s claim that there are people in Iran who do not want nuclear case to be resolved through diplomacy is a lie. Intertesting that there are rival Western and Iranian contentions over respective medias, with Press TV depicted as "state-run Press TV," and the BBC depicted as "state-funded BBC."